The L version of the Fiat 500 is a completely new offering for 2014. Although it shares many styling cues with the 500, like a snub nose and bobbed tail, the 500 is substantially larger, hence more practical as a family transport. Parking the L next to a standard 500 drove home the size difference in a way no set of statistics could. With the tails of both Fiats aligned, the L’s nose projects half a parking slot past that of the 500. The extra length of the L gives you 21.3 cubic feet of storage with seating for 5. The 500 offers just 9.5 cubic feet when 4 are seated. Unfortunately, what’s been lost in the enlargement is cuteness. Where the diminutive 500 looks adorable from any angle, the L looks like a 500 that’s eaten too much pasta. In fact, the L is reminiscent of the Multipla, an inflated version of the original 500 Fiat built back in the 1960s. When you buy an Abarth version of the 500, Fiat reminds you of that fact with close to 20 separate ID badges. When you buy the L, which is powered by the same 1.4 liter turbo that propels the Abarth, you won’t find a single indication of that historical lineage. 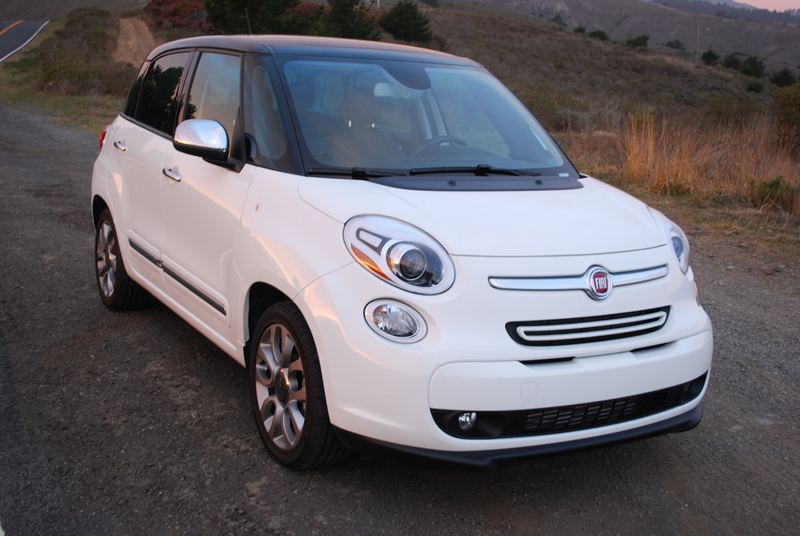 Like the Abarth 500, the L produces a healthy 160hp and 184 lb.-ft. of torque. That’s more than enough to expedite freeway merges. Even back roads passes are possible, provided you’re in the right gear for maximum acceleration. Our test Fiat’s base price of $24,195 included a 6-speed “Euro Twin Clutch Transmission” which was both a blessing and a nuisance. In the blessing department, the automatic saved us from miles of clutch thrashing during a rush hour descent toward the Golden Gate Bridge when 5 lanes merged into 2 at rush hour. On the other hand, we would have preferred the available 6-speed manual gearbox for most of our week with the L because the automatic was frustratingly slow to respond to specific gear selection commands. Having driven an Abarth 500 with a manual stick shift, I know how much fun this engine package can be. In comparison, the L’s Euro Twin Clutch is rather a disappointment. When seated in the cockpit of the L, you feel like you’re flying an airplane. The view from the front reminded me of a glider flight I piloted thanks to the greenhouse-like airiness of the Fiat’s window structure. In particular, a couple of enormous vent window panes promote vision to frontal quadrants usually obscured from view. A similar pair of panes wrap around the rear pillars of the roof, affording excellent sight lines to the rear. A $950 optional Power Sunroof completes the transparency formula. Out on the open road, the L buzzes along in the 60-70mph range with minimum wind and road noise. Thanks to its interior spaciousness and its all around vision, the L is much easier to drive on the freeway than the cramped 500. Lane changes in the L are especially easy. By contrast, the post behind the driver’s door in the base 500 makes every lane change a dicey proposition. 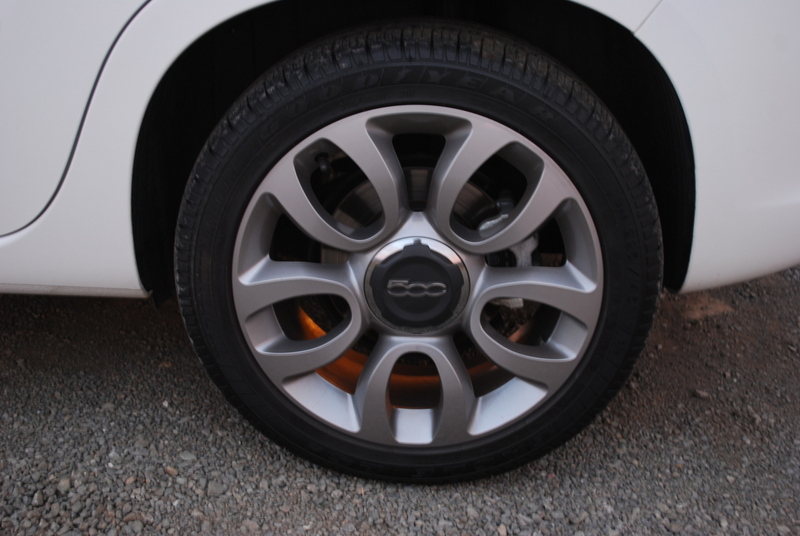 Handling, however, is just adequate, even with extra cost ($500) 17 inch alloys wheels with 225/45R17 Goodyear Eagle LS2 tires. A curious pulsation in the power steering system on curvy roads eroded confidence in the L’s level of grip. 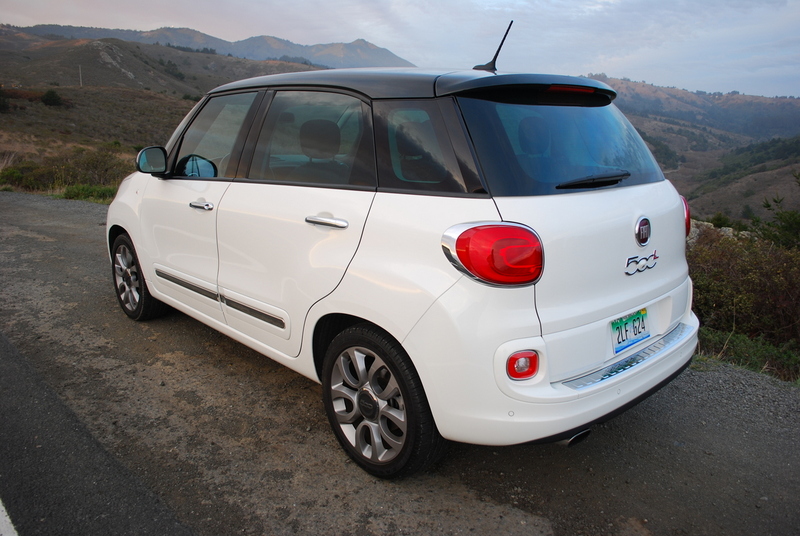 After 3 straight hours in the L on an extended drive from San Rafael to Carmel, the new Fiat proved its mettle by using just half a tank to reach destination. In fact, I made the return trip on the same tank as well, and averaged close to 33 MPG for the duration of my week with the car. However, extended time in the back seat is definitely not recommended. The seat cushions are rock hard, the back rest angle is barely adjustable and too upright, and there are no courtesy lights for reading. This hostel-like lack of amenities is a shame, because rear leg room is spacious. The front seat situation is considerably better, thanks to supportive lounge chairs with standard heating, one-touch electric power windows, and remote keyless entry, all included in the base price. You do, however, need to insert the switchblade-like folding key into the ignition slot in order to get started. A minor ergonomic annoyance develops when you manually position the steering wheel in its lowest position. This setting, which is the least bus-like of those available, obscures the upper half of the dashboard from view. 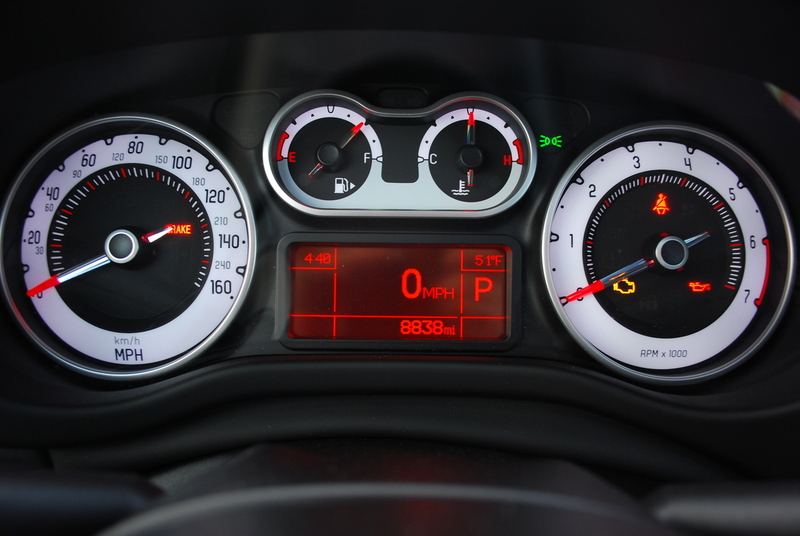 If it weren’t for the digital speed read out, which duplicates the hidden speedometer needle, you’d never know how fast you’re travelling. 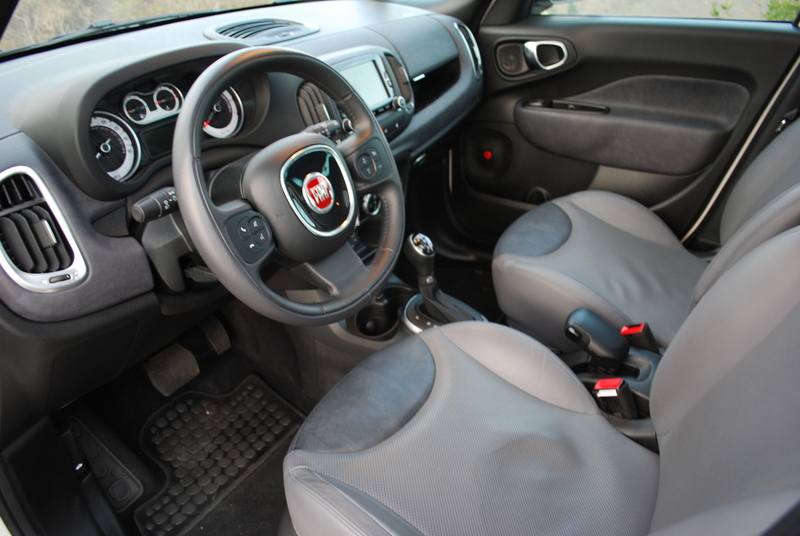 Despite such minor ergonomic quibbles, the 500L is a practical, sizeable and affordable addition to the Italian brigade. While it may not be as cute as its little brother, the L will prove infinitely more practical to own in the long run.